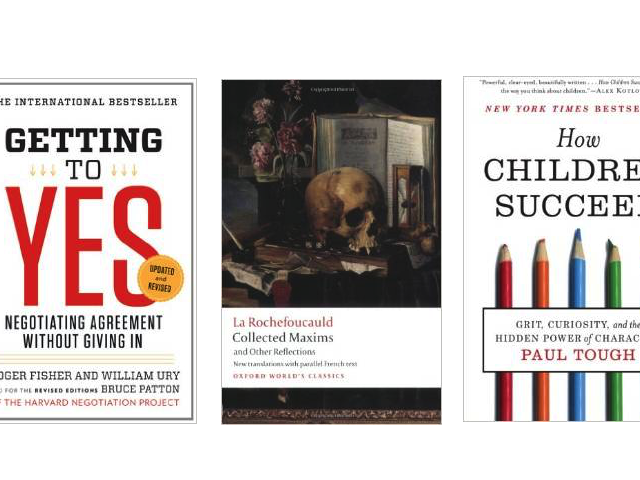 Bill Gates, long an avid reader, attended the TED conference again this year and continued his tradition of recommending books to fellow attendees. Historian Doris Kearns Goodwin studies the lives of America’s 26th and 27th presidents to examine a question that fascinates me: How does social change happen? Can it be driven solely by an inspirational leader, or do other factors have to lay the groundwork first? In Roosevelt’s case, it was the latter. Roosevelt’s famous soft speaking and big stick were not effective in driving progressive reforms until journalists at McClure’s and other publications rallied public support. The eloquent essayist Eula Biss uses the tools of literary analysis, philosophy, and science to examine the speedy, inaccurate rumors about childhood vaccines that have proliferated among well-meaning American parents. Biss took up this topic not for academic reasons but because of her new role as a mom. This beautifully written book would be a great gift for any new parent. The historian Vaclav Smil is probably my favorite living author, and I read everything he writes. In this book, Smil examines the materials we use to meet the demands of modern life, like cement, iron, aluminum, plastic, and paper. The book is full of staggering statistics. For example, China used more cement in just three years than the U.S. used in the entire 20th century! Above all, I love to read Smil because he resists hype. He’s an original thinker who never gives simple answers to complex questions. Business journalist Joe Studwell produces compelling answers to two of the greatest questions in development economics: How did countries like Japan, Taiwan, South Korea, and China achieve sustained, high growth? And why have so few other countries managed to do so? His conclusion: All the countries that become development success stories (1) create conditions for small farmers to thrive, (2) use the proceeds from agricultural surpluses to build a manufacturing base that is tooled from the start to produce exports, and (3) nurture both these sectors with financial institutions closely controlled by the government. I picked this one up after seeing it on a Wall Street Journal list of good books for investors. It was first published in 1954, but it doesn’t feel dated (aside from a few anachronistic examples—it has been a long time since bread cost 5 cents a loaf in the United States). In fact, I’d say it’s more relevant than ever. One chapter shows you how visuals can be used to exaggerate trends and give distorted comparisons. It’s a timely reminder, given how often infographics show up in your Facebook and Twitter feeds these days. A great introduction to the use of statistics, and a great refresher for anyone who’s already well versed in it. 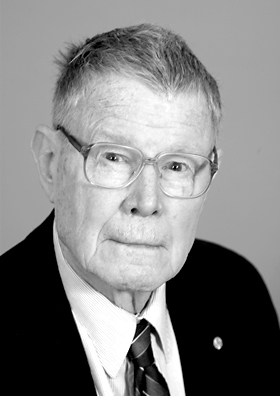 Here is what Nobel laureate Thomas Schelling, who won the prize for “having enhanced our understanding of conflict and cooperation through game-theory analysis,” that culminated in The Strategy of Conflict, had to say about which books influenced him and why. These books give readers a taste of the best in natural science, social science, classical and modern history and literary style. I have had a fascination with evolutionary biology, provoked by such beautiful books as George Gaylord Simpson’s This View of Life, but had never picked up a copy of Darwin’s original work until ten years ago. I have rarely had such pleasure and excitement in reading a sustained piece of scientific reasoning and presentation of evidence. It is technically accessible to any intelligent reader. It is a genuinely participatory experience. I knew that classical Greece produced people at least as smart as people anywhere today, but until I read this I had no idea how modern they were in their thinking. Nothing written in this century can touch Thucydides (or the people he quotes) for subtlety of political and diplomatic discourse and strategy. I like Rex Warner’s translation in the Penguin edition, but some readers may need large print. If you like it go on to Herodotus and Xenophon. Interaction Ritual: Essays in Face-to-Face Behavior by Erving Goffman. I was hooked on Goffman from the time I read “On Face Work,” the first essay in this collection. If you like this try “Stigma,” “Forms of Talk,” and “Asylums.” He looks at the same people we look at doing the same things we see them doing, and he sees things we can’t see without his help. He once pointed out to me that a woman can be naked with her husband without embarrassment, naked with her sister without embarrassment, but not naked without embarrassment in the presence of both. I bought a copy in 1943 because it fit in my pocket and I was vaguely aware that it was a classic. I read it for an hour on a streetcar and was captivated by the story, the style and the purported author. It is an endlessly digressive autobiography that begins with his conception and barely gets up to his birth. Sterne writes a lovely, leisurely sentence that can wind on for three hundred words and you never lose your way or have to look back. I have a book on baseball that says fear is the fundamental factor in hitting, and hitting with the bat is the fundamental act of baseball. For John Keegan, a distinguished military historian, fear is the fundamental factor in exposing oneself to enemy weapons, and exposing oneself is the fundamental act of combat, as he vividly describes, at the level of the individual soldier, the battles of Agincourt, Waterloo and the Somme. A superbly thoughtful history of military combat. 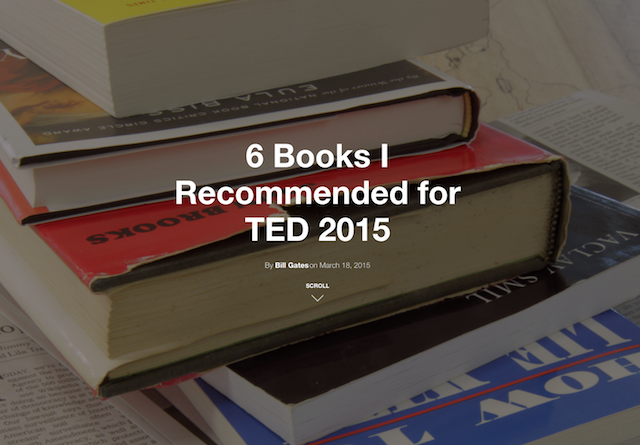 For more in this series check out the books that influenced E. O. Wilson and B. F. Skinner. Too often life gets in the way of reading and thinking. Rarely are we given a chance to look back at what influenced our thinking. Sometimes these are small fragments — words, thoughts, marginalia, ideas, or even a book. 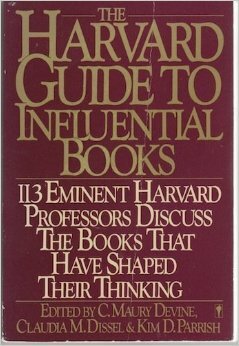 The Harvard Guide to Influential Books: 113 Distinguished Harvard Professors Discuss the Books That Have Helped to Shape Their Thinking contains an annotated listing of the books that mattered to over a hundred Harvard University faculty members along with some commentary on why. Here is Pulitzer-winning writer and naturalist E.O. Wilson’s contribution. I was an adolescent, from fifteen to eighteen years of age, when I encountered the books that were to have the most profound and lasting influence on my life. Thereafter I read thousands of books, many of equal or superior quality, and put most to good use; but I have to confess that individually they have had a steadily declining effect on my world view, style and ambition. Hence I can only offer you works that might, either literally or as examples of a genre, influence a certain kind of young person to take up a career as a biologist and naturalist. More I cannot promise. Even as a small child I dreamed of going on faraway expeditions to collect insects and other animals. This book set my imagination on fire, and I was thereafter a nesiophile, a lover of islands, the concrete symbols of new worlds awaiting exploration. The compulsion was one of the mental factors that led me in later years to develop (with Robert H. MacArthur) the theory of island biogeography, which has become an influential part of ecology. Although I was later to see Lysenkoism for what it was, false in conception, political in aim, and very nearly the death of Soviet genetics, I was enchanted by this little book when I encountered it at the age of sixteen. It appealed to my mood of rebelliousness. It seemed to me that Lysenko was offering a radical and effective challenge to conventional science, and that even the callow and inexperienced might have a chance to proceed directly to new realms of discovery. When I was a seventeen-year-old college student, these Menckenesque essays broke me out of the fundamentalist Protestant faith in which I had been raised and moved me toward the secular humanism with which I increasingly identify today. I still find Wylie a delightful read. The perfect young man’s book: a vision of a pure life devoted to the search for scientific truth, above money grubbing and hypocrisy. How I longed to be like Arrowsmith, to find my mentor in a real Gottlieb. The feeling was intensified when I discovered Jack London’s Martin Eden shortly afterward. By defining the biological species in strong, vital language and connecting the process of species formation to genetics, Mayr opened a large part of natural history to a more scientific form of analysis. This is an example of a very heuristic work, which invited young scientists to join an exciting quest in field research. More than forty years after its publication, I am still wholly involved in this effort. I hope that I have not missed the editors’ purpose entirely by listing books that affected one rather rebellious adolescent in the 1940s, but I was quite surprised myself when I came up with this list after careful reflection. Let me make partial amends by citing the work that I pull off the shelf most often, and gives me the greatest pleasure, now that I am in my fifties: Meditations, by Marcus Aurelius. For this work reflects the point to which I have come, in company with such a magnificent spirit who “bears in mind that all that is rational is akin, and that it is in man’s nature to care for all men, and that we should not embrace the opinion of all, but of those alone who live in conscious agreement with Nature.